I've never been able to contrive a straight answer to the question of what kind of music I play. Most styles and genres seem to center on systems of rules that I find too confining --or perhaps more accurately, that I can't master. In most things intellectual and aesthetic I've been more interested in edges and fringes than in central foci, in the exotic than the quotidian. This is as true of my choice of instruments as of my professional identities: though I started with guitar about 40 years ago, I've always lusted after the sonic qualities of the oud, the bouzouki, various mando family instruments. When I started building myself (in the early 1980s) it was long-necked carved-top instruments that most interested me. Purchase of a 1918 Gibson K1 mandocello in 1982 provided me with an instrument with unplumbed possibilities --very few people play mandocello, so there aren't many prescriptions for what it's supposed to do. I met Daniel Heïkalo in April 1983, and we immediately struck up a musical friendship that has grown continuously ever since. We've traded tapes, enthused over obscure musics and musicians, and played many hours of duets with various combinations of instruments. Since I left Nova Scotia in 1990 we've managed only a few days a year of playing together, and in the last few years we've taped bits of our encounters. This year Betsy convinced me that I should just do what I've been saying I wished I could: spend a week playing, record everything, see what resulted. So that's what we did with a mid-April week of vacation: 24 hours of driving in each direction, with a truck full of instruments, and 5 days of playing at Horton Landing. These two tapes are part of the outcome, in an unmixed and unedited form, pretty much straight from the digital recorder (a couple of pieces have overdubs). Each morning and afternoon we did an hour or so of recording, nearly all of it improvised on the spot, combining whatever instruments we were inspired to pick up, and never stepping in the same river twice. Some of the improvizations start from known tunes or themes or riffs, but a lot came out of thin air and developed via the chemistry (and physics, I suppose) of listening to each other. In some cases the sonic quality of a particular instrument or technique predominates or determines the direction, and in others it's serendipity that seems to rule. There are plenty of dropped stitches and infelicitous choices amongst possible improvisatory and harmonic pathways, but there's a lot that flat out amazes me as I listen to it. I'm no closer to being able to name this music, but now I'm absolutely sure that it's the sort of music I want to play. It's nearly impossible to put Daniel's contributions to this project into words. His skill as a player is so obvious that its moment-by-moment description is unnecessary (and impossible, when you come right down to it). It's one thing to be able to play the tar out of an instrument, and entirely another to be able to listen to somebody else at the same time and complement what one hears --to contribute to a syncretic whole that emerges from the moment. I never play so well myself as when I have Daniel to bounce off of. And Daniel's burgeoning capabilities as an engineer made it possible to capture these fleeting moments in a digital form that will eventually result in a CD version. Some of the pieces have provisional titles (like "pas d'vant les enfants" --"Not in front of the children...", and several are loosely blues, generally "too many bars blues" because they decline to be confined to 12-bar structure) or contain identifiable musical quotations. Some are pure enigma. Very few have (or seek) anything like commercial potential. But jeez it was a lot of fun. K1 Gibson mandocello (1918), now set up as "8vo mandocello", with the paired strings in octaves. In some pieces Daniel plays this with a slide. 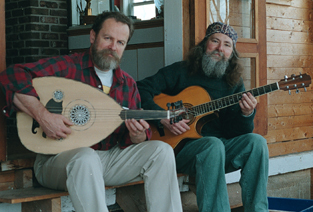 Daniel plays his magnificent Laskin guitar, a nylon-string classical, and a cittern I built in 1982 and gave to him in 1991. He also contributed bass and tenor recorders and dumbeks and frame drums.